Looking to power your home with solar? This is everything you need. A homeowner’s solar guide to becoming an informed decision maker. 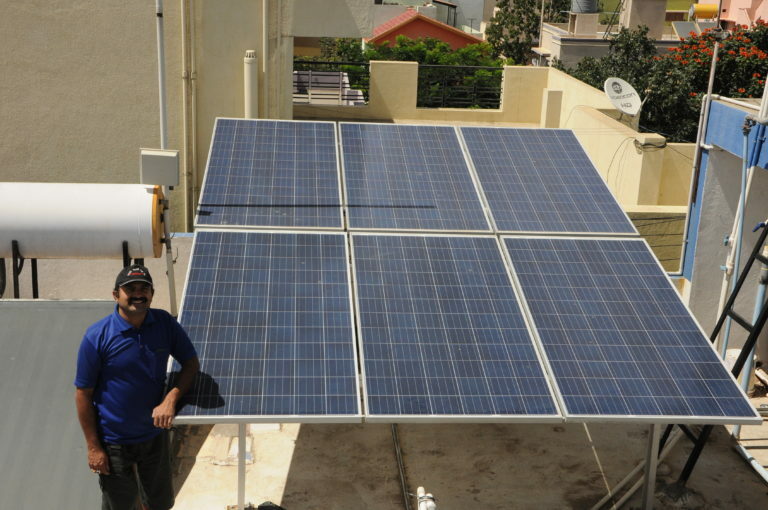 Mr Sivaraman, a rooftop solar owner, poses next to his panels in Kasturi Nagar, Bangalore. In a typical day in your life, you play different roles and carry out various jobs as a part of society, your family, and as a human being. You cook, clean, travel, work, watch TV, use your smartphone, sleep, and maybe even fly an aircraft. In almost everything that you do, the common denominator is energy in a usable form – electricity, gas, oil, ATP (Adenosine Triphosphate – the energy currency of life). We do not want to be a know-it-all. So, we’re going to stick to our strength and focus only on electricity. Have you ever stopped to think how much you spend on electricity, or where it comes from? 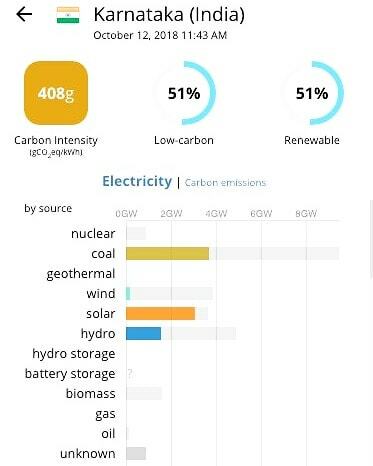 On October 12, 2018 (image above), more than 51% of Karnataka’s energy supply came from renewable sources. The typical cost of bringing renewable energy to your home is lower than that of conventional sources. 1. Efficiency begins at home. 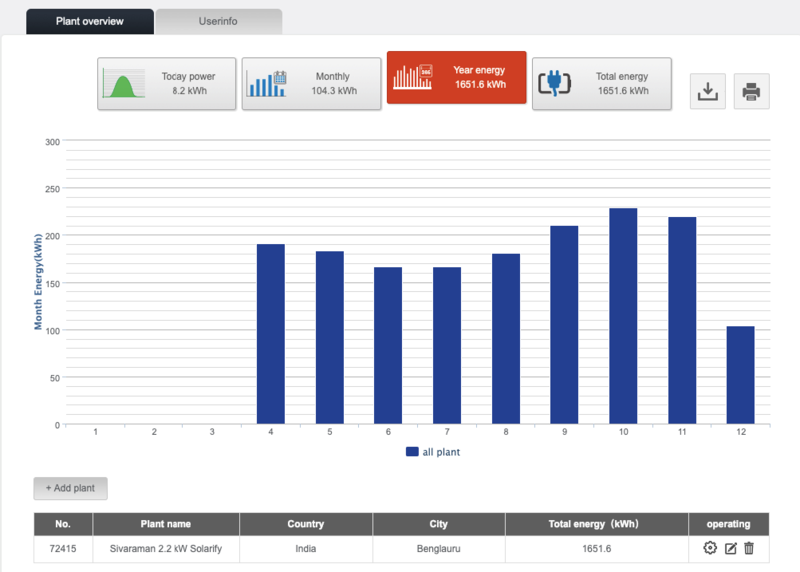 The first step is to understand if you’re doing everything you can to reduce your electricity consumption. Needs of others should always outweigh your own wants. Could you be turning off the geyser as soon as the water is hot enough, or setting the temperature of your air conditioner at an optimal 24-25 degrees Celsius, or even turning off lights that you don’t need during the night? Okay, to give you some context from our personal experience, earlier this year we installed an automated timer for our front board at the office. By doing this, we were able to save 9 hours of electricity on four 20W LED tube lights – which roughly translates to 20 units of power in a month. 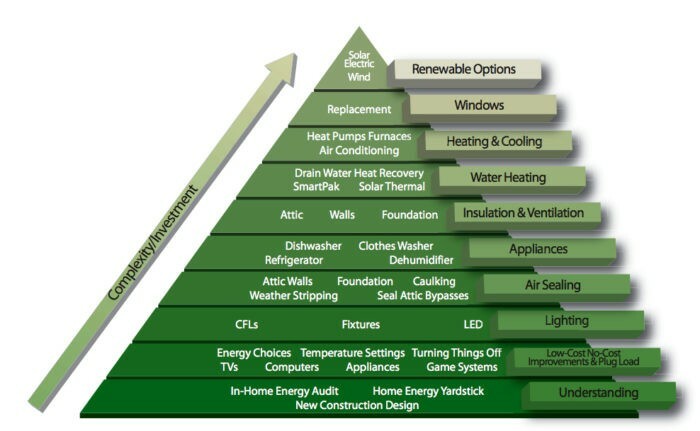 Source: Green Energy Advisor | Energy efficiency is the first step to making better energy choices. By choosing to turn off lights when not needed, we were able to reduce our default needs. In the context of solar power, this will help you decrease your cost for electricity, and also reduce the size of the solar power system that you need – both resulting in financial savings even before making the switch to solar power. Technologically and financially, putting up a solar power system at your home is a long-term commitment – a minimum of 20 years. Are you going solar because to do so is eco-friendly, or is it just the financial benefit you’re interested in, or could it be both? In any case, you should be clear about why you’re adopting solar power for your home. This will help you determine the extent of time and money you’d like to spend in turning this idea into a reality. 3. Figure out what you might need. 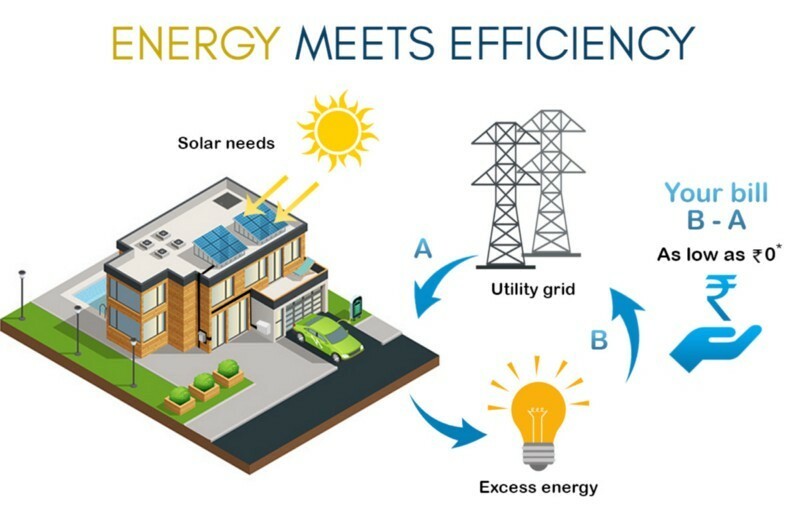 Since solar energy technology isn’t something we interact with on a day-to-day basis, it’s best for you to spend a little time to understand what you might need. You could talk to people who own solar power systems, explore the internet, and even visit an installation. The usual choices you have are among the types of inverters (which determines the kind of system) and the kinds of solar panels available in the market. The types of systems are on-grid, off-grid, and hybrid. The choice depends on the frequency, duration, and timing of power cuts – which is an indicator of utility grid stability in your neighbourhood. An unstable grid supply is usually the case in rural areas – may be someplace like your weekend get-away farmhouse – wherein going off the grid is ideal. This system has batteries which store solar power. A visual representation of net metering with an on-grid system. Getting a basic understanding will help you position yourself as an informed consumer – and safeguard you from unethical and pushy salespersons. One of the most important decisions you make in the process is choosing the right service provider. A good solar installer will provide you with the freedom to choose while making the choices relevant to your lifestyle and future requirements. Finding that balance between cost and quality can be a pain. But, this depends on how quickly you want to break even on your investment – and how long you plan to stay in the house. Like with any other product, a system of higher quality will last longer – but also costs more. Here is where the installer adds value to your decision-making process. An ethical company would give you a clear and transparent picture of various aspects such as technology, cost, government policy, projected financial returns and environmental impact, and timelines – before, during, and after installation. If an organisation is hush-hush about even any one of these aspects, you should consider it as a red flag. The process we follow at Solarify. 5. Know the difference you can make. Also, when you go for a solar power system for your home, you are able to create value for yourself and your environment. To be educated on how you do that is central to your motivation to go solar. Each kilowatt of solar power requires about 100 square feet of vacant, shadow-free area. As a homeowner with rooftop solar, your environmental impact is direct. With more energy being produced through solar, the state would spend less on buying electricity from thermal (coal) power plants. Decentralised power production through rooftop solar minimises costs and losses for everyone involved. In any case, rooftop solar power systems are designed for impact. Good installers are able to provide maximum impact through great design and empathic understanding of the homeowner. Designed For Impact: Our simulation for a homeowner. 6. Data tells you a lot. As a homeowner, how do you determine if the projected financial returns and environmental impact are legitimate? Today, most solar power systems are equipped with a remote monitoring device that provides 24×7 access to the generation done by the system. Alternatively, the information can be found on monthly electricity bills along with the financial savings. Doing this will help you weed out installers who upsell specific panels or inverters that might not perform well in the long run – but gives the company high sales margins. After understanding all the information, you might or might not be keen on going ahead with the installation for your home, and that is alright. After all, as a consumer, you have the right to choose. But often, by delaying the decision without a concrete reason, you don’t get around to achieving anything at all. This tends to happen even when you pay a lot for your electricity. You probably worry about it for a day and forget about it as soon as the bill’s paid off. With tariffs being hiked at 6% to 9% every year, not worrying about the way you consume electricity can burn a bigger hole in your pocket than ever before. You have an option to change that, and even reduce your electricity expenses to zero by adopting solar power at your home. A decision will save your time as well as the installers’. The last thing you need is some sales representative making that follow-up phone call for something you do not need urgently. You could say something as simple as, “Hey, with all the information, I’ll not be going ahead for now.“, “We’ll be keen on taking this up after a year. I’ll be happy to speak to you at that time.” Bam! That’s a win-win for everyone. 8. There’s more than one way to pay. 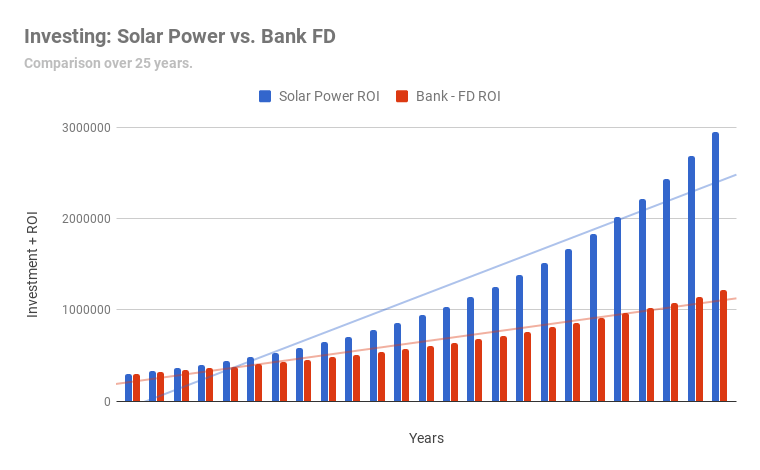 We’ve often heard homeowners say, “I don’t think we have the bandwidth to invest in solar right now.” It’s not your fault. Installers have made the market unnecessarily shielded – and that tends to overwhelm homeowners like you. The reality, however, is different. From loans, staggered payment options, leasing, there are ways you can put a solar power system on your home’s rooftop without having to put all the money in yourself. Of course, the benefits are different in every option. Today, investing your own money gives the fastest and highest returns on investment. A good installer will be able to educate and provide you with these options, acknowledging what’s best for you. Overall, the choice must always be in your control – and it’s in your own best interest to make a decision only after you know everything and are satisfied with it. We have put this together for you by gathering expertise from our team – who have a combined experience of 7 years – by addressing concerns of homeowners and empowering them to make wise decisions. We hope we did so for you as well. For stuff you don’t find on Google. If you have more questions or suggestions for us, feel free to WhatsApp us directly on 9742454443, or do the same by clicking here.